We've already proven to you that we, The PubGuys, are flexible. That's how we can swap hosts at our locations without missing a beat. This week, you guys proved to us how flexible you truly are. At the last minute this week, we had to cancel trivia at one of our other locations (Thanks Texas Department of Corrections!). 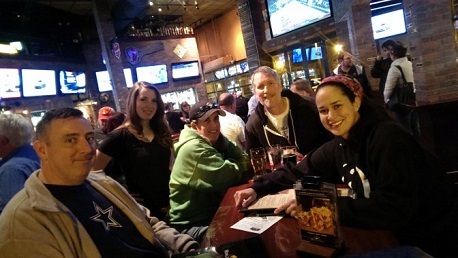 So we notified our loyal players of the change and recommended they descend on World of Beer in Arlington. Proving that we have the best trivia players around, we had several teams travel to Arlington to get their trivia fix. Congratulations to our winners, This is Our PLC, Mi Familia, and the Mouseaholics! Thank you to the teams that ventured over from our other location, 5-Hole Returns and I Dream of Trivia. And welcome to the club, Mi Familia, we're happy to have you. Keep an eye on those league standings since we only have a few weeks left. Don't forget to follow us on all the social networks for tips, hints, and tricks of the trade. Oh yeah, if you want a bonus point next week, simply tell me how many hits Pete Rose compiled in his MLB career.